The incredible story of McLaren Automotive continues with the announcement of a second consecutive year of profitability four years since the company opened its first retailer. The achievement is considered unprecidented in today’s motor industry. The company has also recorded its fourth year of sales growth and is predicting more following the launch this year of a quartet of new models – two of which are already sold out – and the establishment of a three tier product structure reinforcing its future as a British based manufacturer of luxury sports cars, and only luxury sports cars. Led by Chief Executive Officer Mike Flewitt, in 2014, the company generated an operating profit of £20.8m (2013: £12.4m, + 68 percent) and a profit before tax of £15.0m (2013: £4.5m +233 percent). These profits were generated from turnover that grew from £285.4m in 2013 to £475.5m in 2014. The company ended 2014 with record sales as it has done every year since it first began producing its current range of cars in 2010. A total of 1,649 vehicles were delivered to customers around the world, an increase of 18 percent over 2013. Following the introduction of the 650S in Coup� and Spider form at the 2014 Geneva Motor Show where the two models were launched simultaneously, strong demand for the core McLaren model range saw sales reach 1,401 units. In addition, 248 examples of the McLaren P1™ (2013: 36) were delivered – around two thirds of car’s total 375 unit production run. McLaren Automotive has continued to focus on developing new product. During 2014 the Company invested £91.8m in R&D, up from £67m in 2013, which represents almost 20 percent of turnover. Looking forward, this percentage is expected to be maintained in 2015 as the company continues development of its model range. Crucial to this is the new Sports Series. The 570S Coup� is the first model and was revealed at the beginning of April 2015 at the New York Auto Show. This has already been followed by a second, the 540C Coup�, which was launched a few weeks later in Shanghai. Together they take McLaren into a new segment and put the brand within reach of a whole new audience. A second body-style will be introduced in 2016 followed by another in 2017, by which time the Sports Series is forecast to more than double the production output of McLaren Automotive to around 4,000 units per annum. This number, while deliberately small in industry terms, will allow McLaren to thrive and is in line with the wish of its clients that its products should forever remain a rare sight to protect not just the brand’s exclusivity but also the investment of owners. The core McLaren range, the Super Series, continues to find new audiences. The track focused 675LT was launched in March at the International Geneva Motor Show. Limited to just 500 units globally, these all found buyers in just a couple of months. Production commences in July alongside the 650S Coup� and 650S Spider which is currently the only open roofed, mid-engined sports car available globally that is capable of more than 200mph. The final and 375th example of the McLaren P1™ is due to be produced later this year. It sits alongside the track only McLaren P1™ GTR, production of which has just begun, in the third and most exclusive McLaren product tier, the Ultimate Series. To be produced in even more limited numbers, the McLaren P1™ GTR is a 1,000PS technological showcase for the brand and was displayed in production ready form earlier this year at the International Geneva Motor Show. Owners will be offered the opportunity to join the McLaren P1™ GTR Driver Programme which has its first meeting at the Circuit de Catalunya, Spain, later this year. From October, the McLaren Production Centre will concentrate on production of the Super Series and new Sports Series, orders for which already take production well into 2016. The network of McLaren retailers grew to cover 30 markets with the additions of Chile, Scotland and Thailand. New sales outlets were also opened in existing markets bringing the total number of outlets to 71. More development is planned in 2015. 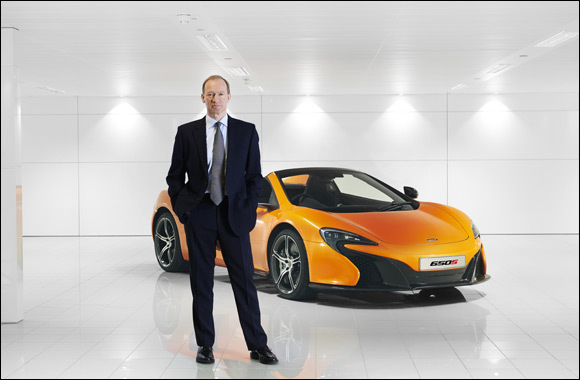 Growth was recorded across all four of the McLaren regional business units. The Asia-Pacific region saw the biggest rise with sales increasing by 80 percent over 2013 with 11 new retail locations across the region helping to fuel this growth. The North American market remained the largest market for McLaren accounting for more than 30 percent of overall sales, while sales in both Europe and the Middle East grew year-on-year by 10 percent and nine percent respectively. As well as investing in new products, McLaren Automotive continues to care for another important asset: its people. The number of employees based across its global facilities increased by 25 percent against 2013 to a total of 1,283 employees. Of these, 33 percent are employed in engineering. This is an increase from 2013 reflecting a focus on creating a sustainable future for the brand through the constant development of new and exciting product. As production rises further, the number of people employed globally by the brand will grow even more. Commenting on the 2014 year end performance, Mike Flewitt, Chief Executive Officer of McLaren Automotive explained: ‘These latest results highlight that McLaren Automotive continues to push boundaries and are testament to the energy and professionalism of the teams in Woking and around the world, including our retail partners and suppliers. We have seen the third consecutive year of growth for the brand, and a second year of profitability, which is a fantastic achievement and perhaps unprecedented in the modern automotive industry.